Bought the new PC, and want to optimize and speed up. 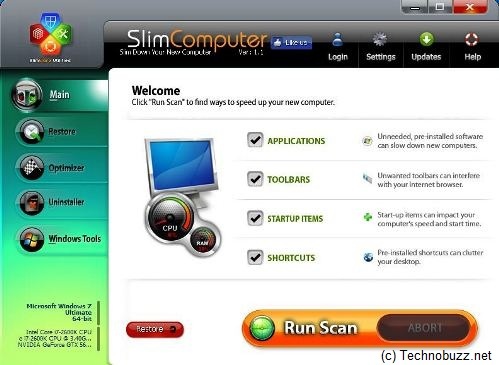 Then you have to try am small new app SlimComputer, it helps you to get rid of any unwanted software installed in your computer, free of any junk files that might slow it down. These day most of the new computer are come with full of trial apps and pre-installed apps. So SlimComputer will help you clean them. Its simple to use go to Slimcomputer.com and download the free app SlimComputer from there and install it in your new PC. After the installation you can start the Scan to know about the unwanted apps and Junk file in your PC, so you can remove them easily. It has also the restore option which helps your restore the removed items easily.